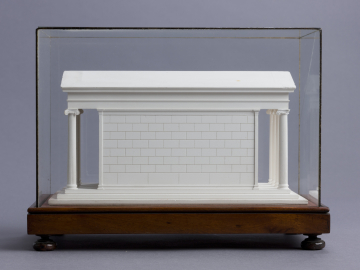 Model of the ancient Greek Ionic temple on the Illisus, near Athens, 'restored', c.1800-1834, plaster of Paris. 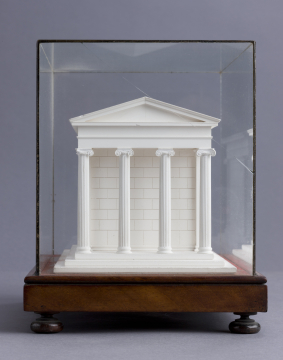 You are here: CollectionsOnline / Model of the ancient Greek Ionic temple on the Illisus, near Athens, 'restored', c.1800-1834, plaster of Paris. This small Ionic temple was built on the banks of the river Ilissus in Athens and is more properly identified as the Temple of Artemis (Diana) Agrotera, or Artemis the Huntress. Although not much survives of the temple today (most of it was demolished in 1778), it appears to date to the 5th Century BC and is possibly the work of the Greek architect Kallicrates who worked on the Parthenon. The little Temple of the Ilissus at Athens […] is a beautiful example. Nothing can surpass the extreme simplicity and elegance of this composition. The beautifully proportioned columns, the angular capitals, and simple entablature are most happy effects of the refinement and elegant taste of the enlightened people to whom this work owes its origin. 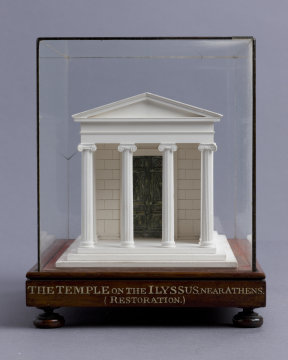 This small model reconstruction of the Temple evokes the beauty of the original Temple. A model reconstruction was first made by Jean-Pierre Fouquet, for the Ecole Polytechnique in Paris but this version was produced by his son, François Fouquet. 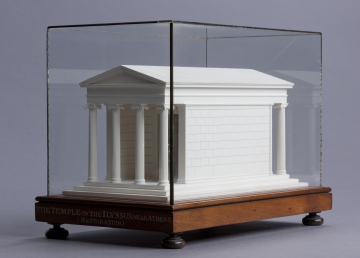 François based his model on plates I-VIII, chapter II of James Stuart and Nicholas Revett’s The Antiquities of Athens, first published in 1762, with a French translation published in 1793 (Sir John Soane’s Museum has the only known copy of this French translation). Sir John Soane purchased the twenty models by François Fouquet in 1834 from the architect Edward Cresy (1792-1858) who, from 1829 to 1835, worked in Paris. Soane paid Cresy the substantial sum of £100 (£10,136.78 in today’s money). It is likely that Cresy purchased the models directly from Fouquet et Fils.